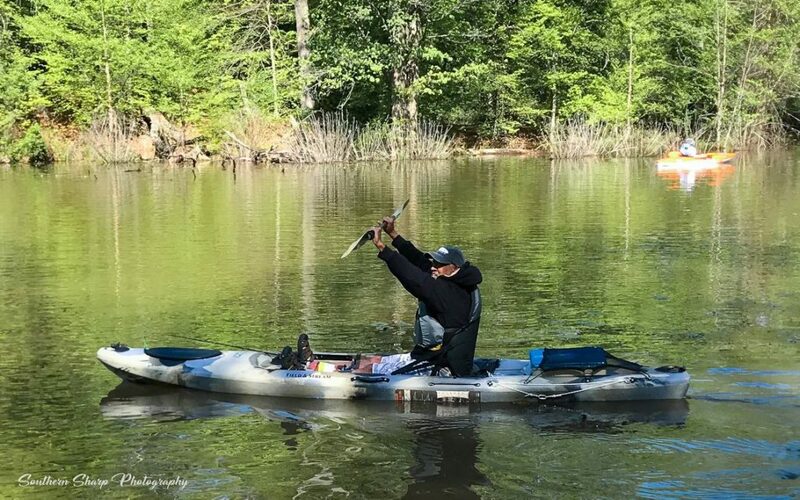 A brisk morning turned into a warm spring day on Saturday April 28th for Friends of the Lower Appomattox River siignature spring event RiverFest. Thanks to a large group of Fort Lee volunteers, the set up was a breeze and vendors arrived to a perfectly mapped out park. Ferndale Appomattox Riverside Park served as the beautiful backdrop for a day full of river recreation, celebration, and education (and even one sneaky stowaway chicken!). Nearly 1,000 event-goers could try paddling around in kayaks, viewing indigenous snakes up close, try their hand at fishing, and even meet an owl and opossum! For lunch, Bishop’s BBQ and Southern Exposure food trucks were on site serving up delicious southern staples. Offering a refreshingly cool treat, Hau Lani Hawaiian Shave Ice was serving a multitude of flavors, yum! Thanks to Trapezium Brewing Company, all event attendees with an ID wristband were able to enjoy after-party specials at their Old Town Petersburg location the night of RiverFest. Special thanks to our title sponsor Anthem Healthcare, Caremore, Benefinder and our legacy sponsor Virginia American Water! Both sponsors also provided informative exhibits at the event. As the Activities Co-sponsor, Fort Lee hosted the kayaking, obstacle course, and archeology demonstrations exhibit. There were many other outstanding exhibitors to enjoy including: AWARE wildlife, VA DGIF, Petersburg Area Regional Tourism, RVA Goats and Honey (and the chicken), and the Virginia Department of Conservation and Recreation. From kids enjoying the playground to kids-at-heart practicing their paddling skills, RiverFest 2018 was a big hit! Mark your calendars for the next exciting FOLAR event, the 11TH Annual Paddle-or-Battle the Appomattox River, to be held Saturday September 29th 2018. See more photos at our FOLAR Facebook page.